In 1654, Great Yarmouth established a parish workhouse in the former Hospital of St Mary the Virgin which had been founded in 1277 during the reign of Edward I. The old hospital chapel was used as the workhouse dining room. The Poor are chiefly maintained in a Poor-house, where they are employed in making nets for mackerel and other small sea fish. A few spin worsted. There are about 15 or 16 beds in each room, mostly of feathers, placed close together. Boys, girls, men and women have separate rooms. The married, of whom there are not many, have separate rooms. There are two rooms for the sick, well aired but not distinct from the main building. There is a good dining-room, and suitable conveniences for cooking but the lodging rooms and staircases are not well planned or in the best order. From the great number of people sleeping in a room close together, many disagreeable circumstances must frequently happen, besides the general injury to health. There are 65 men, 148 women, 40 boys and 42 girls in the house. Table of diet: Breakfast—Sunday, Wednesday, Saturday, bread and butter; Monday, Thursday, bread and treacle; Tuesday, Friday, bread and broth. Dinner—Sunday, suet pudding; Monday, Thursday, boiled meat, dumplins and vegetables; Tuesday, Friday, pease soup and bread; Wednesday, Saturday, milk or gruel and bread. Supper—every day, bread and cheese. At every meal, except when there is milk broth or gruel, one pint of beer is allowed to each person who wishes to have it. Rice, milk, wine, etc., are allowed to the sick. Mutton and veal are allowed to the sick every Sunday. By 1836, the workhouse generally had three to four hundred inmates who were maintained at a weekly cost of three shillings. The parish also had 78 poor-houses in various parts of the town which were occupied rent free by poor families. Yarmouth Poor Law Union was formed on 29th March 1837. Its operation was overseen by an elected Board of Guardians, 16 in number, representing its single parish which had had a population of 21,115 in 1831. 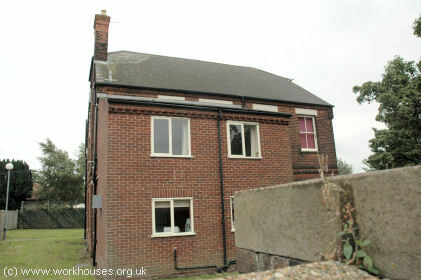 The new workhouse was built in 1838 in Great Yarmouth at the east side of Northgate Street. The Poor Law Commissioners authorised an expenditure of £7,100 on construction of the building which was to accommodate 300 inmates. It was designed by John Brown, the Norfolk county surveyor. Brown designed several other Norfolk workhouses at Blofield, Henstead and Docking, as well as ones in Suffolk (Plomesgate, Stow), and Essex (Colchester). His design for Yarmouth was somewhat unusual for the period, having its long two-storey main building at the front. The ancillary buildings (kitchens, dining-hall, laundry etc.) to the rear, and the infirmary at the east, did however show the influence of the more popular "square" designs of the day. The site layout is shown on the 1905 map below. Yarmouth entrance block from the south-west, 2000. On 15th April, 1891, Great Yarmouth was joined by the parish of Gorleston, previously part of the Mutford & Lothingland Incorporation, to form the Great Yarmouth Poor Law Union. The new union, whose population in 1891 was 48,720, was administered by a 20-strong Board of Guardians — 16 from Great Yarmouth and 4 from Gorleston. In 1894, the British Medical Journal set up a "commission" to investigate conditions in provincial workhouses and their infirmaries. Following a visit to Great Yarmouth, the commission's report made a number of criticisms about the care provided for sick inmates. The buildings were old and cramped and the wards were haphazardly organised, with little classification of the various types of case. Although the staffing of the wards for for imbeciles and idiots was judged to be satisfactory, no trained nursing staff were employed to deal with the two hundred or so medical cases — at night, no nursing cover was provided at all. 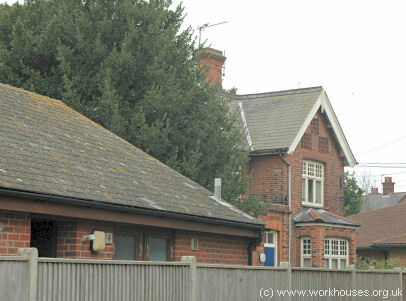 The report recommended that a projected scheme to move children to separate accommodation away from the workhouse be accelerated as this would free up a more recently constructed block for use as sick wards. Further details are available in the full report. 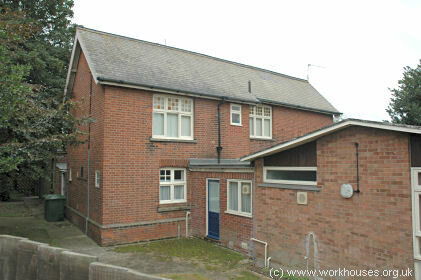 From 1904, to protect them from disadvantage in later life, the birth certificates for those born in the workhouse gave its address just as 150a Caister Road, Yarmouth. The former workhouse site is now Northgate Hospital. An isolation hospital, now Estcourt Hospital, was erected at the east of the workhouse. It was run by the local borough council and not connected with the Yarmouth Poor Law Union. In the early 1900s, Yarmouth Union operated a children's cottage homes site at Gorleston. It was located between Burnt Lane and Clarence Road (now Addison Road). Some of the original houses at the north of the site still survive. Norfolk Record Office, The Archive Centre, Martineau Lane, Norwich NR1 2DQ. Few records survive — holdings include: Guardians' minute books (1837-1930, with large gaps); Cottage Homes admissions and discharges (1914-33); etc.